Sheep Dip 8 Year Old Vatted Malt Whisky is a popular Whisky available from DrinkSupermarket.com in 70cl to buy online. Visit DrinkSupermarket.com for the best price for 70cl of Sheep Dip 8 Year Old Vatted Malt Whisky or compare prices on our other Whisky products. Rich, copper colouring gives a delicate and refined nose. Soft sensual herbaceous notes arise in perfect unity supported by an attractive array of complex fruit ambience. Melon, pear and orange with an innuendo of almonds conclude this profusion of charming nuances. Finesse and elegance gives way to a majestic assertion of unblended malty tastes drawn from the four distilling regions of Scotland. Where to buy Sheep Dip 8 Year Old Vatted Malt Whisky ? Sheep Dip 8 Year Old Vatted Malt Whisky Supermarkets & Stockists. 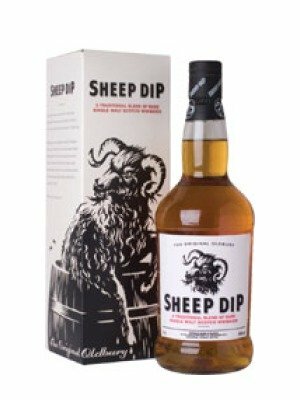 You can buy Sheep Dip 8 Year Old Vatted Malt Whisky online in most retailers and find it in the Whisky aisle in supermarkets but we found the best deals online for Sheep Dip 8 Year Old Vatted Malt Whisky in DrinkSupermarket.com, TheDrinkShop, and others. Compare the current price of Sheep Dip 8 Year Old Vatted Malt Whisky in 70cl size in the table of offers below. Simply click on the button to order Sheep Dip 8 Year Old Vatted Malt Whisky online now.